THE IDIOTS' BOARD: GECKOS TRADING FEVER! 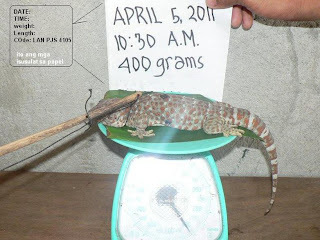 Because of it's greater medicinal possibility of curing cancer, asthma, tuberculosis and even Acquired Immunodeficiency Syndrome (AIDS) geckos (locally known as tuko) are in-demand not in the market but in private negotiations involving thousands of pesos apiece. And at some point reports would claim, that geckos could even cost to Millions depending on it's weight. Geckos hunting and trading has become a fad in the country. It buries the wanting of the masang Filipinos to acquire the latest gadgets, hearing the latest news on the senate investigation concerning the anomalies involving the Philippine Charity Sweepstakes Office (PCSO) and even losing their interests to the upcoming State of the Nation Address (SONA) - for the sole purpose of searching and selling geckos. This geckos fever caused the former first couple of the Philippines to get back from their European tour and engage themselves in the fast growing trading and small scale industry. - So long there is money, there'll always be glory (Gloria). By virtue of trade and commerce, one's purpose is to prosper what benefits everybody else but welfares entrepreneurs the most.